The report is available on the UN website or available here [pdf]. The press release is here, and an FAQ is here. “Never in the past has our knowledge of science been so profound and the possibilities to treat all manner of diseases so great … and yet, many people and communities in need of effective prevention methods, life-enhancing and life-saving treatments and rehabilitation do not receive them,” the report says in opening. The United Nations High Level Panel on Access was constituted in November 2015 with the mandate to review and assess proposals and recommend solutions for remedying the policy incoherence between the justifiable rights of inventors, international human rights law, trade rules and public health in the context of health technologies. A key aspect of the findings is “coherence,” panellists said in a teleconference today. “An important factor behind the incoherence between human rights, trade, intellectual property and public health lies in the diverse accountability mechanisms and transparency levels of these different, but overlapping spheres,” the report states. While trade and intellectual property-related accountability mechanisms are regulated by the World Trade Organization Dispute Settlement Body, “human rights and public health accountability mechanisms are characterised by varying and often limited degrees of precision, legal weight and enforceability,” it says. The report uniquely calls for public health assessments to be done with every free trade negotiation to assess the possible impact on public health, and for the creation of public health patentability criteria. “One of the key recommendations of the report is that this should not happen, and countries that threaten and retaliate against others for using their entitlements under the TRIPS Agreement will be forced to face significant serious sanctions for doing so,” he said. That requires collaboration by the WTO, which is not a UN agency, he said, but which needs to be brought to the realisation that its members have to comply with the Doha Declaration. The High Level Panel recommendations calls for WTO members to commit to respect the WTO Doha Declaration on TRIPS [WTO Agreement on Trade-Related Aspects of Intellectual Property Rights] and refrain from any action what would limit its implementation. Countries should make full use of the flexibilities enshrined in the TRIPS Agreement, and use the policy space available in Article 27 of TRIPS “by adopting and applying rigorous definitions of invention and patentability that are in the best interests of the public health of the country,” including amending laws to curtail the ever-greening of patents and awarding patents only when genuine invention has occurred. Governments are also called to adopt and implement legislation facilitation the issuance of compulsory licences. “WTO Members must register complaints against undue political and economic pressure which includes taking punitive measures against offending WTO Members,” it adds. The panel also recommends that governments engaged in bilateral and regional trade and investment treaties should ensure that these agreements do not include provisions that interfere with their obligations to fulfil the right to health. Public health impact assessments should be undertaken, inform negotiations, and made publicly available. The High-Level Panel also recommends that several United Nations agencies collaborate with one another and with other relevant bodies with the relevant expertise to support governments to apply public-health-sensitive patentability criteria. Those UN agencies include the UN Conference on Trade and Development (UNCTAD), UN Development Programme (UNDP), World Health Organization (WHO), World Intellectual Property Organization (WIPO) and the (non-UN) World Trade Organization (WTO). According to the report, “universities and research institutions that receive public funding must prioritize public health objectives over financial returns in their patenting and licensing practices.” Those practices include the use of non-exclusive licences, the donation of IP rights, participation in public sector patent pools and other mechanisms that maximize innovation while promoting access, the report says. The experts also called for governments to increase their current levels of investment in health technology innovation to address unmet needs. “Stakeholders, including governments, the biomedical industry, institutional funders of healthcare and civil society, should test and implement new and additional models for financing and rewarding public health research and development (R&D), such as the transaction taxes and other innovative financing mechanisms,” it says. They encouraged negotiations at the WHO for a binding research and development Convention “that delinks the costs of research and development from end prices to promote access to good health for all.” That convention “should focus on public health needs, including but not limited to, innovation for neglected tropical diseases and antimicrobial resistance and must complement existing mechanisms,” they said. “Governments should strengthen national level policy and institutional coherence between trade and intellectual property, the right to health and public health objectives by establishing national inter-ministerial bodies to coordinate laws, policies and practices that may impact on health technology innovation and access,” the report indicates. They called for the United Nations Secretary-General to establish an independent review body tasked with assessing progress on health technology innovation and access, which would monitor challenges and progress on innovation and access to health technologies under the ambit of the UN 2030 Agenda, and progress made in implementing the recommendations of the High-Level Panel on Access to Medicines. Membership of this review body should include governments, representatives from the UN and multilateral organisations, civil society, academia, and the private sector. Civil society should be financially supported to participate and submit their reports on innovation and access to health technologies at this Special Session, the report says. (2) any public funding received in the development of the health technology, including tax credits, subsidies and grants,” says the report. The report also asks that government establish and maintain publicly accessible databases with patent information status and data on medicines and vaccines. This information, the panel said, should be periodically updated and consolidated by WIPO in collaboration with stakeholders to develop an international easily searchable database including standard international common names for biological products, and international non-proprietary names for products, either as known at the time of application or after the granting of a patent, and the dates of grant and expiry. Médecins Sans Frontières (MSF – Doctors Without Borders) said in a release that the report outlines the global failure of the medical research system to develop medicines, vaccines, and diagnostics that address unmet medical needs affecting communities across the globe. “MSF welcomes the panel’s recommendations on the need for new incentives for research and development, for greater transparency, as well as for strategies to deal with intellectual property barriers, all with the aim of improving medical innovation and access to health technologies,” the release said. “We welcome the call for the UN Secretary-General to set up a process where governments will negotiate an R&D Convention, based on the principle of delinkage, so that medical innovation can be steered towards public health priorities and deliver affordably priced products. Sustainable solutions are needed, ” he added. “The UN panel has recommended governments embrace new ways to pay for innovation and to increase access to health technologies. Under the current system, we rely too much on high drug prices to incentivize innovation, and this reduces access. The most important recommendations from the UN experts is to delink the cost of R&D from the prices of drugs. You cannot rely upon high drug prices to finance R&D without harming patients and creating unequal access. Policy coherence means making innovation and access happen at the same time. Delinkage is key to policy coherence. “This report gets to the heart of the problem with access to medicines – that the intellectual property rules promoted by the pharmaceutical industry are at odds with the human right to health. If implemented the report’s recommendations will go a long way towards ensuring all people have access to affordable quality medicines. Canadian HIV/AIDS Legal Network Executive Director Richard Elliott said in a release that the statement made in the report that free trade agreements endanger countries’ efforts to ensure access to medicines, means Canada and other countries should not ratify the Trans-Pacific Partnership agreement as it stands. “[T]he panel notes that countries concluding such agreements are in dereliction of their human rights obligations by doing so before undertaking a transparent, public assessment of its impact on access to medicines and public health,” he said. Health Action International also commended the report for “recommending alternative innovation models that embrace the concept” of delinkage, and for calling for a binding R&D Convention that includes a Code of Principles for Biomedical R&D. Industry responses are coming in, and they are showing disappointment. “Nearly every important medicine of the last century-and-a-half — including antibiotics, vaccines, HIV and HCV treatments, cancer and cardiovascular medicines — owes its existence to the R&D activities of the biopharmaceutical industry,” the release said. The US Chamber of Commerce industry group issued a release with the sharp title, “U.S. Chamber Condemns UN Report Attacking Patents.” The Chamber’s Global Intellectual Property Center (GIPC) Executive Vice President Mark Elliot in the statement charged that the panel had pre-set conclusions and missed the real causes of high prices and limiting availability. He also cited the US government’s concerns and criticism about the panel. “The irony is that by singling-out patents, this report has attacked the innovative systems that have actually produced thousands of cures and saved millions of lives. Decades of research have shown that the private sector is responsible for as much as 97 percent of drug development. If adopted, these recommendations could prohibit the creation of future breakthrough treatments,” he said. “The Panel called on governments to drastically restrict patentability of medical innovations; make liberal use of compulsory licenses to override patents; minimize the private sector role in the research and development of new cures; and, put the United Nations itself above national governments in oversight of intellectual property rights,” the Chamber representative concluded. In the Commentaries section of the report (p.65), panellist Andrew Witty, the GlaxoSmithKline CEO, gave some encouraging words, but lashed out at parts of the report. “Nobody would dispute the need for improvement in both innovation of healthcare technology and access to it,” Witty said. But he hailed the advances in medical technologies, including through partnerships and collaborations, and the enormous progress and contributions made in the past decade or two, which he said are often taken for granted. These have been largely brought about by intellectual property, he said. Then he asserted that the report makes two “false or at least highly dubious implicit assumptions,” including that the clinical or financial value of an innovation is clear at the time of discovery and patenting. “It almost never is,” he said. The second is that national governments will commit or be able to raise the large sums of funding needed to incentivise future innovation. Witty also urged caution on use of compulsory licences for medical products, and noted that the panel could not agree on this issue. And he contended with the suggestion that information about the costs of developing an innovation should be shared with regulatory authorities, and opposed consideration of patentability criteria related to health. In the end, Witty does not dismiss most considerations of the panel out of hand, but invites a more thorough analysis in order to determine what should be done. Panel Co-Chair and former Swiss President Ruth Dreifuss, responded to industry concerns in an email to Intellectual Property Watch. 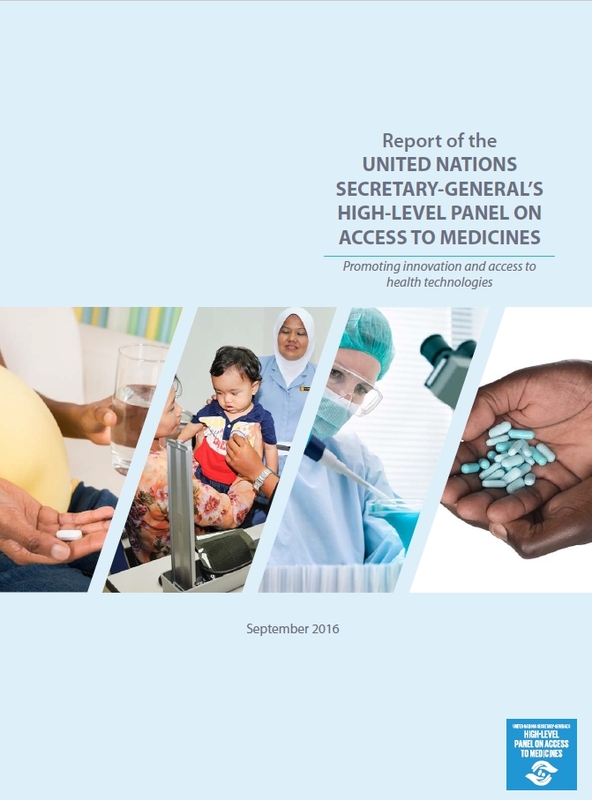 "UN High-Level Panel On Access To Medicines Issues “Landmark” Report" by Intellectual Property Watch is licensed under a Creative Commons Attribution-NonCommercial-ShareAlike 4.0 International License.